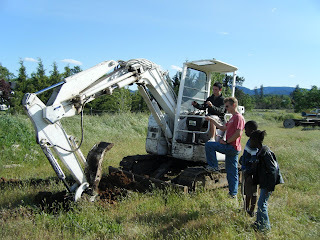 DELIGHTING IN HIM: An Excavator and A Doctor! Thankfully the doctor and the excavator were on separate days and for separate reasons!! 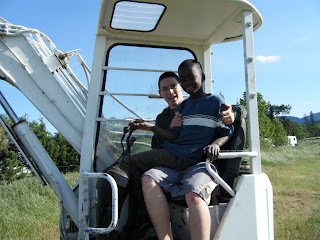 Here are David, my nephew, and Caleb on the excavator at our friend's house yesterday. 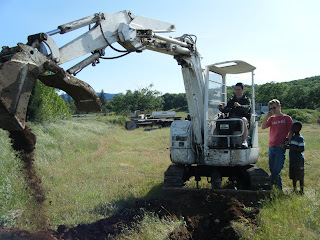 David was given the opportunity to run the small excavator. He said it was not easy to get how to maneuver it, but he had fun trying. As you can see he did get a load of dirt in it. They were also given the opportunity to ride 4 wheelers and go-carts. All boy fun stuff. They had a great time. Hannah was able to play with her friend all the girly stuff. Then at dinner without mom to stop her she stuffed herself on meat and rolls!! One of the things that can happen with a child with food issues. When she got home last night her stomach was very swollen and tight from overeating. Thankfully she is feeling better today. afternoon. He spent the morning with Grandma Mae and was helping with lunch and sliced open his thumb pretty good. Two hours later, when we were still not able to get it to stop bleeding, we took him into the doctor. Thankfully Joy had left a medical release and the doctor was able to close it with glue instead of stitches. Good ending! !